We recently reviewed the life stages of a butterfly. And you know that I like hands-on learning and what better hands-on learning is there for learning about butterflies than to watch them grow right before your eyes. We got the Insect Lore Butterfly Pavillion. This pavillion is improved over the one we got a few years ago. I especially love the zippered opening near the bottom of the pavillion which makes it easy to put in fresh nectar for the butterflies. With the pavillion you also get a certificate that you send in when you are actually ready to receive your caterpillars. Allow about 2 weeks to receive the little guys in the mail. We were excited to receive our caterpillars. They come in sealed cups with holes for fresh air and enough food to last until they turn into chrysalis. There are two big windows on each of the cups so you can watch everything the caterpillars are doing. Rachel was totally fascinated with watching them. Actually both of them were fascinated. It was really fun to watch the two of them. They checked on the caterpillars every few hours. In honor of our new friends, we had "butterfly" pasta for lunch. The kids continued to check on their caterpillars over the next week or so. When it got close for the caterpillars to transform into chrysalis, they spent more time on the top of the container. They hang upside down from a paper lid inside the plastic lid on the container. Then very slowly they transform. Once they had all completed their transformation, they just hung from the lid in their hardened shells. I took off the plastic lid to show the chrysalis' to the children. At first Rachel wasn't too sure about them. Then she was sure that she did not like them at all. They were kind of funny looking and the swung back and forth a little when I took off the lid so they looked very "alive". At the point, you need to transfer the chrysalis' to the pavillion. To do this you simply take the paper lid out of the cup and use a safety pin to attach it to the mesh side of the pavillion. They hang there for a few days like this. This step is really quite boring. But one morning, we awoke to find real butterflies in our pavillion! Yay! Nicholas was actually the first to notice them. He had gotten into the habit of checking on the every day. He really studied them at times and would report to me on what they were doing throughout the day. Again, Rachel was hesitant at first. She looked scared and wouldn't go near the pavillion. But eventually she realized that they were just butterflies and that she was safe. She inched her way closer to the pavillion and eventually started talking to the butterflies. The pavillion is really a great way to watch the butterflies. You can see completely through the mesh walls or the clearn lid. To feed the butterflies, just wet a paper towel in a sugar-water solution and place it in the bottom of the pavillion. It was fun watching the butterflies drink from the paper towels. We really enjoyed watching them in the butterfly stage the most and we could have kept them longer. That is, until I saw two pairs of them getting a little too friendly with each other. So, sadly, it was time to release them in our backyard. Nicholas and Rachel said bye to them before we let them go. It was easy to just reach in the pavillion and get a butterfly on your hand. This was really fun. But you have to keep the top closed or you'll have some sneaky ones escape when you aren't looking as we had happen in this picture. Nicholas even helped Rachel get one on her hand but she was a little too skiddish to really enjoy it. 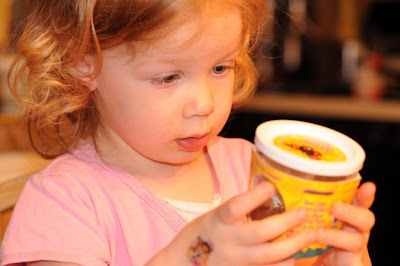 Raising butterflies is a delightful experience that every child should experience. It is very educational but fun too. And the Insect Lore kits make it so easy to do.